After last week's grayling trip there was only one place we wanted to be this weekend, and this time me and James were joined by Richard. A 4am start meant we were ready at dawn, and we really hoped the sequel would be as good as the first visit. Both James and Richard were soon into the grayling but I struggled with the trout, watching them in the water the grayling were quickly bullied out of the way - frustrating stuff. 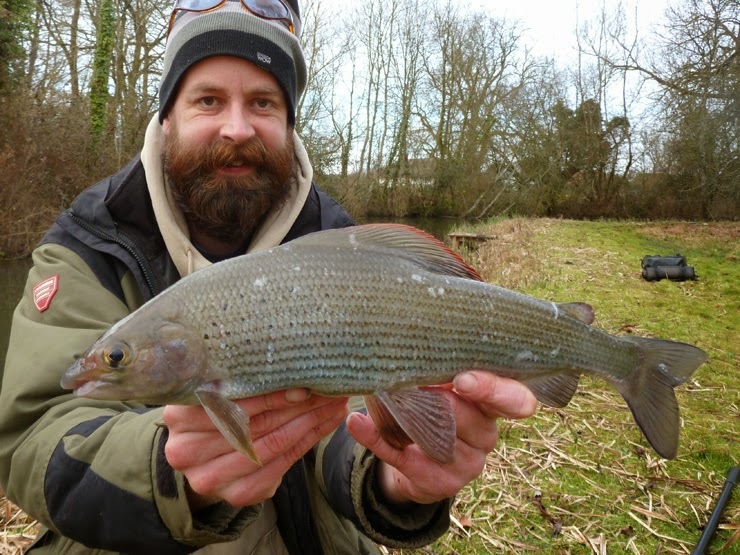 We spread out and after a couple of hours, and only one small grayling, my struggle was interrupted by a phone call - James had landed a two pounder just downstream. I shot down for photo duties and to admire a stunning fish, a two is rare on this stretch - but I still wanted one. James was stalking individual fish in the slower paced water with far fewer trout, and I was soon following suit. 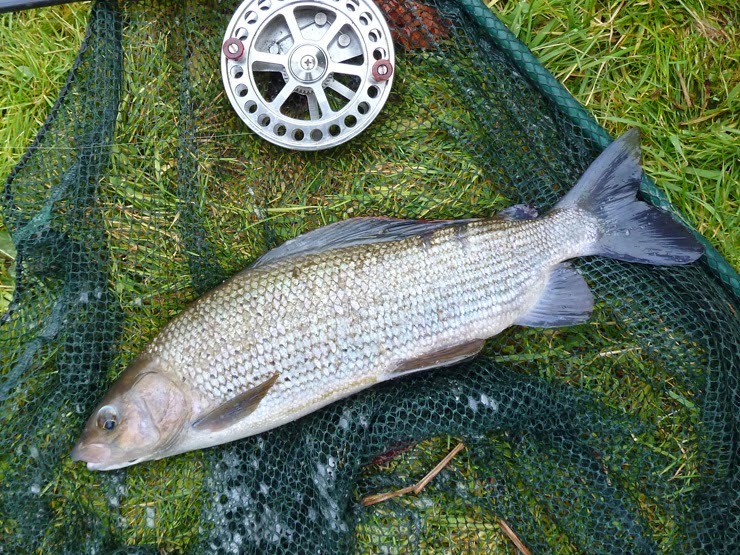 It worked, a lot of searching but I started getting a few grayling on the bank, including two over a pound, 1lb 3oz (above) and 1lb 12oz (below) - great stuff! 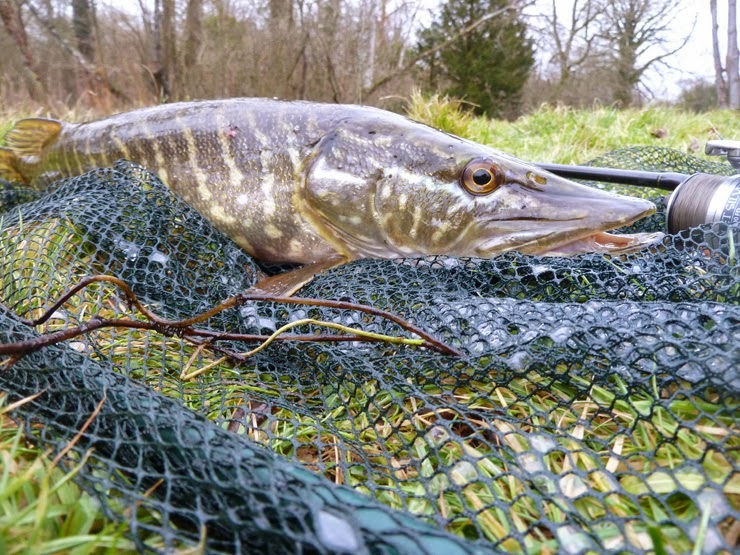 With a few grayling on the books I set out looking for a pike, scanning the bottom with polaroids, but instead of a pike I spotted a big grayling holding station - and shot back to get the trotting gear. I returned and it was still there and hit my maggots first trot, monster on and my knees were jelly - next problem, in the excitement I'd forgotten the landing net - but James was in earshot and was soon there to net the biggest grayling we'd ever seen. The scales rested on 2lb 1½oz! A beautiful old warrior, new PB and a fish bigger than I'd even hoped for - before seeing James' fish a few hours before. We fished on into a day that seemed to go by in a flash, sunset was soon upon us but there were plenty of fish and more of the beautiful river had been explored. Both myself and James had a two, and although Richard didn't manage to get among the bigger grayling he did manage his first rainbow trout. Everyone had a great time. A fantastic day - again, I'm really liking this grayling fishing and although I think that's it for this season I'd love to return when it gets cold next season. So it's a massive thanks to Chris and the guys, a brilliant sequel to last week's trip! Yeah, like I could resist those pike! Landing my old friend, the eleven from last week and after numerous scrapes and near misses in the clear water a beautiful 5lb 0oz jack on a wobbled sprat. Taking my weight for the season to over 100lb, but I'm still going to need a few good trips if I'm going to achieve my target. Well done Brian, only took a further week to get your 2lber! 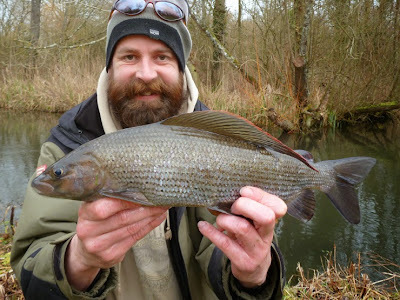 And it looks as though the beauty of grayling has grabbed hold of you - just think of them when you're staring at the "tip" on the local river. Still - I must try and get that gudgeon. Cheers. What a beautiful fish, they take on a grey/blue colour as they get bigger - unlike the newly minted silver small ones. Yeah, I'm hooked. Was down the 'tip' on Sunday clearing it up with the trust volunteers, the stretch looked great when we were done... Shame it won't last! Sorry I didn't see you at the clean up on Sunday as snowed under with DIY here. I see there was a huge pile pulled out. I'm sure we'll both be on a future clean up, seen your mammoth DIY projects on Facebook... think I'd rather be down the river! It amazed me just how much crap was in there!! I did notice they were doing a clean up yesterday, but apart from not being sure where to park around there (I'm not one of the biking brigade) I was out chasing the ladies - a bit sunny but otherwise brilliant day for it.... They also go a mottled grey under the chin when they get to 2lb+. 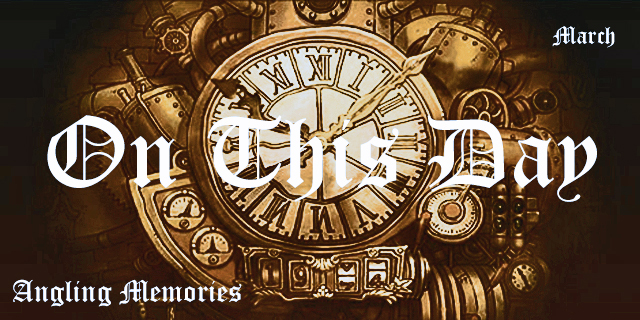 If you join the mailing list they email you in advance. I got there by rail-replacement bus - nightmare journey! 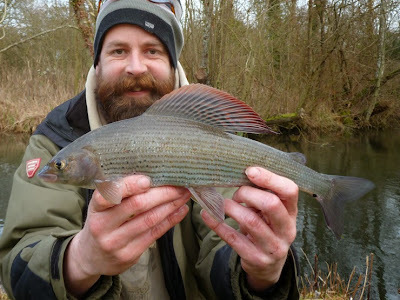 Any luck with the grayling? 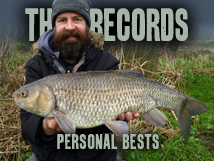 Red letter day on Sunday, best 2.11 with another ten over 2lb. Makes a change from previous visits! Going back again tomorrow, different stretch though, and again on Friday if I can stand the pace. Tried MHP today for light relief and had just the one chub at 2.12 on the float. Still trying for my gudgeon, but will probably need to take the tip rod for that. What a result - great stuff! With those results I'm sure you can handle the pace! !